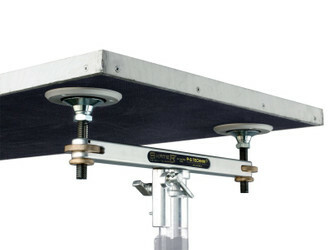 Use the SKATER® Levelling Support to hold and easily level a custom-made tracking board for your SKATER® Camera Dolly and work at any camera height. The 28mm pin fits directly into standart lighting equipment. An adjusted levelled height can be fixed with a blocking nut. Each Levelling Support comes with 2 Guidance Rings to be mounted on the bottom side of your tracking board to keep the board into position. Manfrotto/Foot Base small, #299 FBASE, Avenger Steel Extensions C622, C624, C626.